Why call us for custom shutters in DFW? 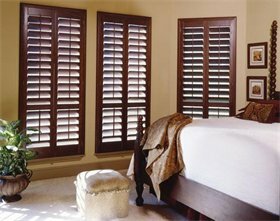 We are the premiere custom plantation shutter company in the Fort Worth area. We use only top quality shutter materials. Customer service and quality is our #1 priority on all installs. Unlike many of our competitors, we are NOT just a dealer for shutters. Many companies buy shutters in bulk from China at a measurement that is close to your window measurements. Instead, we hand build every one of our plantation shutters at our local manufacturing plant in Denton, TX - no middlemen. We are family-owned and operated. When you call, you speak directly with our owner, NOT a middleman or pushy sales person. Because we are locally owned and operated in the Denton, TX area, we are able to save you money by keeping our costs down while still ensuring you get the highest level of quality when it comes to custom interior shutters in McKinney, TX and Celina. We offer free quotes on the best materials and have customer testimonials across DFW including reviews on Angie's List and Service Magic. Call today! Casement: The frame around a window. The casement face is parallel to the window glass. Capping (aka Flashing): Placed on top of the shutter, capping blocks water from seeping into the wood. We include aluminum capping at no charge with every shutter order, and offer copper capping as an available option for a distinctive look. Flush: Completely level so as to form an even surface. Head: The free-swiveling component of a tie back that holds a shutter in the open position.